Once again, she breaks through with her profound research, experience, and wisdom to move us all forward to thrive. She's right on cue, and I thank her with all my heart for bringing this issue to my attention. I came from a family of seventeen children. I've written mostly about my mother's wisdom and love, and how she managed to take care of all of us, practically on her own. I've always credited her profound faith and devotion to God for her accomplishments and our health. But I really never thought about our strict sleeping and napping patterns that she instilled in us and prioritized, until Arianna brought it to my attention. Only now can I understand it all more clearly. As children, we were so well behaved that she could take us anywhere (sometimes as many as six kids at a time). We napped in the afternoon every day, without fail. And not a day went by when she'd lie down next to the youngest ones at home who hadn't started school yet. She also practiced "early to bed, early to rise," making sure we got at least eight or more hours of sleep. We were never taken out at night while we were very young. Mom believed the night air was not healthy for young children, especially not for babies' immune systems. Any shopping done with children was done during the day and minimal, and she didn't take children visiting at night. After I was married and had a child of my own, Mom frequently called on me to see how we were doing. If it was past 8:00 p.m. and she overheard my toddler still playing, she'd remind to me that my daughter had already had a full day of play and needed sleep. She'd also suggest that a nice bowl of cereal with milk would help calm her before sleep. I find it uncanny that I have seventeen brothers and sisters who somehow made it through childhood, all without prescription anxiety medications. Arianna's research now PROVES what's apparent to me, that it must have been our sleep patterns that have made all the difference for me and my siblings. Ever since Arianna shared her findings on sleep, I've been getting more sleep and feel better in every area of my life. I hope and pray that our next generation, and especially my children and grandchildren, will heed her message that will help create a healthier society for everyone. Once again, Mom was right. 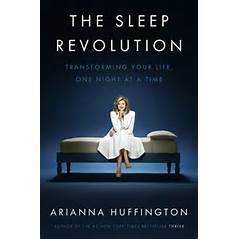 To view Arianna's video about sleep, click on the link: https://www.facebook.com/AriannaHuffington/videos/10154040819378279/. About Catherine Nagle: Catherine grew up in Philadelphia with 16 brothers and sisters, reared by loving, old school Italian parents. Catherine's artist father's works graced churches and public buildings; her mother was a full-time homemaker. A professional hairdresser, Catherine worked in various salons while studying the Bible and pursuing spiritual growth through courses, seminars, lectures, works of Marianne Williamson, and conferences, including the National Theology of the Body Congress. She is also an Ambassador of the Society of Emotional Intelligence. The mother of two children and now a grandmother, Catherine lives in Pennsylvania with her husband and son. She is the Author of Imprinted Wisdom.